We have carved a strong foothold in the market as one of the leading manufacturers and suppliers of MovableHotMixPlants.These are precision-engineered using quality raw materials and in accordance with the set industry standards. Our range is also made available in varied specifications to meet the specific clients’ requirements. Moreover, we offer these at competitive market prices and ensure the delivery at our clients place within the stipulated time frame. Banking on our in-depth industry experience, we offer our clients with an unmatched range of Movable Hot Asphalt Mixing Plants. Ideal for use in various construction and development activities of roadways, these are fabricated in accordance with the set industry standards. We make use of quality raw materials and advanced technology to manufacture these Movable Hot Asphalt Mixing Plants in order to offer our clients with an excellent performance range. Moreover, these are also offered in customized specifications as per the requirements of our esteemed clients. 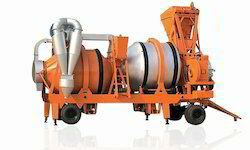 Looking for Movable Hot Mix Machinery ?